Many may remember Equus 3D in its prime, well we are proud to announce that the property has been overhauled and is now ready to welcome fellow equestrians back to see what has been done under completely new management. This once top rated cross country course has been restored back to life and Legacy Farms is proud to offer it for all in the Eventing community to enjoy once again! This course truly was the pride and joy of a very special individual & a well respected equestrian in the community, the late M.H. Lessard. 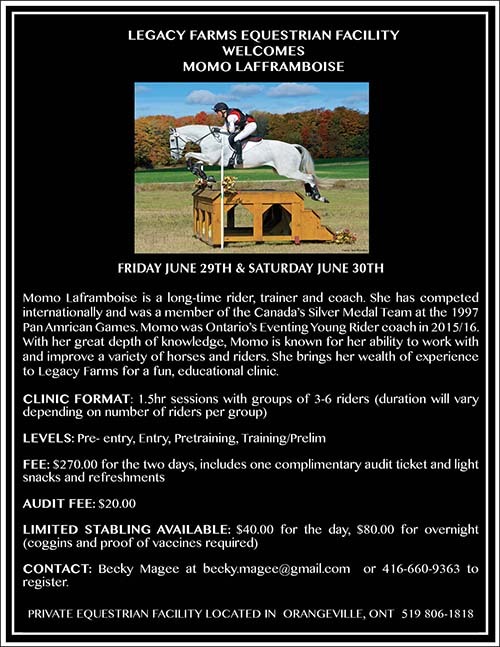 Legacy Farms would like to keep the dream alive and will be officially reopening the course for schooling following the first Legacy Farms Clinic to be held on the weekend of June 29th & 30th with our special guest clinician Momo Laframboise. Legacy Farms would like to dedicate this clinic in honour of M.H. Lessard and we look forward to hosting an annual clinic in her honour to ensure that her legacy lives on. Please contact becky.magee@gmail.com for more information or to register for the clinic.